"You think I need you to tell me about the problems in Texalouisianaflorda? Hardly, if Obama would get out of my way, I'd fix everything." Louisiana Governor Bobby Jindal, ever concerned about the needs of his constituents, spent yesterday attending to Louisianans in the grand ol’ state of Texas. He gave a speech. He hawked his book. He did a fund-raiser. Meanwhile in Baton Rouge, also while Jindal was in Texas, more than 250 people gathered at the state capital to protest the poor job Kenneth Feinberg is doing in compensating the Gulf Coast for its losses as a result of BP’s oil spill. They complained that maids, bellhops and the such at Louisiana hotels are not being compensated from the claims fund, despite them losing money and hours as a result of the drop off in the tourist trade. Jindal, to make sure his citizens understood how much he cared, even though he was in Texas, sent out his Chief of Staff, Timmy Teepell to inform the protesters that Jindal “continues to have concerns about the fairness, timeliness and accuracy” of the claims process and he will someday address them, from Texas or maybe Florida or Ohio, you know, where he is hard at work taking care of his constituents at fundraisers or book store events, these necessary obligations where Jindal is busy raising funds for…Louisiana. 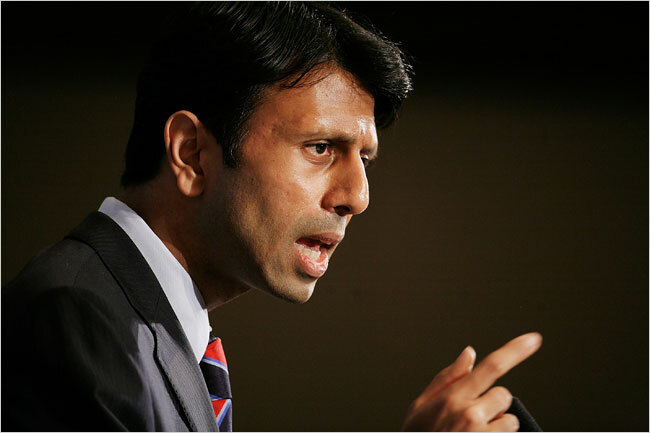 If not, however, perhaps he would be better served by some serious brainstorming on how to fix the problems in his state, listen to his people, attend to their needs…come up with some seriously, creative solutions to blunt the looming damage from the budget shortfall…tor maybe finally admit what many have suspected all along, that Louisiana is a platform for Jindal to higher office and once he flies out of the state for good, he’ll be leaving the people and the problems behind. His response to the report was even more laughable.